The holders are safely through to the next round of the Buildbase FA Trophy. Lee Ndlovu completed a hat-trick as Brackley Town beat Nuneaton Borough 3-0 in Saturday’s third qualifying round tie at St James Park. It took the holders well into the second half to break the deadlock against their Vanarama National League North counterparts who proved stubborn opponents. 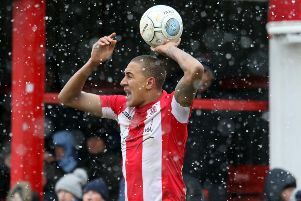 In the end, it was straight forward enough for Saints against struggling Borough. The holders made all the early running, enjoying plenty of possession and Glenn Walker’s cross was headed over by Jimmy Armson. Walker exchanged passes with Matt Lowe before firing wide. A low cross from Ellis Myles found its way through to Ndlovu who shot over at the second attempt under pressure as Borough held firm. Saints kept probing but didn’t ask enough questions of the visitors and lacked a cutting edge in the final third. Borough defended in depth and offered little at the other end but they had a couple of forays late in the first half. Dior Angus burst into the box but was thwarted by Myles while Ryan Jennings saw his close range effort deflected over after good approach play from Adam McGurk. After the restart, Armson glanced a header wide at the far post from Glenn Walker’s inswinging corner. Ndlovu missed a sitter when he failed to convert Connor Franklin’s low cross from six yards following neat build-up play from Adam Walker. Saints finally broke the deadlock in the 57th minute when Glenn Walker helped on Connor Hall’s long pass and Ndlovu turned inside Mike Calveley and beat Cameron Belford at his near post from 15 yards. Moments later, Saints had a strong penalty appeal after Nldovu was clattered by Miles Addison just as he was about to pull the trigger from close range. Walker volleyed Shane Byrne’s deep corner wide of the far post as Saints looked for the crucial second goal. It arrived in the 61st minute and it was that man Ndlovu again. A slick inter-passing move on the right saw Myles link up with Byrne before delivering a low cross into the box which Ndlovu converted at the near post. Ndlovu duly completed his hat-trick seven minutes later when he got on the end of Walker’s pin-point cross to powerfully head home from six yards. Both substitutes went close. Daniel Nti fired wide and Shaun Jeffers was denied by Belford. 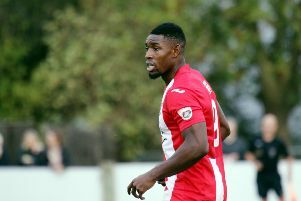 Borough were reduced to ten men in the closing stages when Jennings got a straight red card for a challenge on substitute Shepherd Murombedzi.